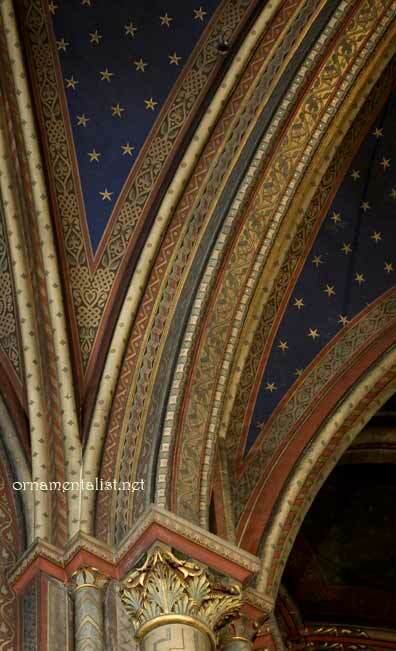 There are few surviving examples of true Gothic decorative painting. Most of what we can see now is the result of the appreciation and revival of romantic and antique styles during the 19th Century. Fortunately in the case of Église de Saint-Germain-des-Prés, reputed to be the oldest church in Paris, there were significant amounts of original 13th and 14th century ornament to document, despite fires, the sacking of the church in 1789, and the ill use of the building during the next ten years which greatly damaged its interior. 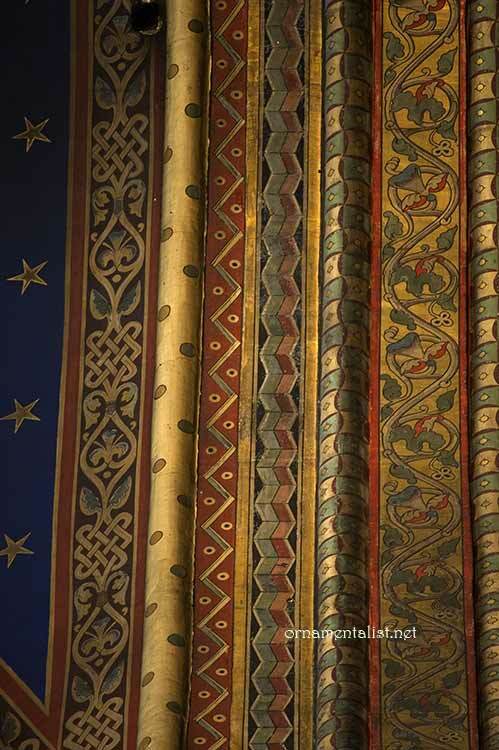 The decorative painting as we see it now, was restored/recreated in 1845. It is remarkable how some of the oldest ornament looks the most modern. Those geometric borders (polka dots!) especially. An interesting description of the history of this church can be found in this text of a 1921 guidebook. While taking these photographs I had the pleasure of speaking with one of the priests in the church, who pointed out to me some of the better areas to photograph, and explained to me that the many blank areas of the interior had been scrubbed of its paint during more recent repairs. It is hoped that an interior restoration will be scheduled soon. Some of the best ornament in my opinion. Fabulous photos...thanks Lynne! (ironically, my verification word is "parree"
these photos looks yellow and dark but believe me, the surface was so covered with dirt that i was astonished to see even this much color in the pictures. it's nice they are restoring it but i hope they don't get over zealous and either scrub all the paint off as they have in previous efforts, or recreate it with cartoon-bright paint. Your photo's are wonderful! Please take a moment and like our FB page American Friends for the Preservation of Saint Germain des Pres. Lynne, may we use some of your photos for FB and possibly our website? www.preservesaintgermain.org. Thank you Melissa! I will ! and yes you may use my photos for your website. I hope to be back in Paris soon and look forward to seeing the progress there.